Water mages. Bounty hunters. Kraken magic. Pirates. Fans of fast paced, fantastical-element thrillers should love Pacific Fire. Clever world-building, a wry dose of humor, and occasional winks at genre conventions all made for an entertaining read. 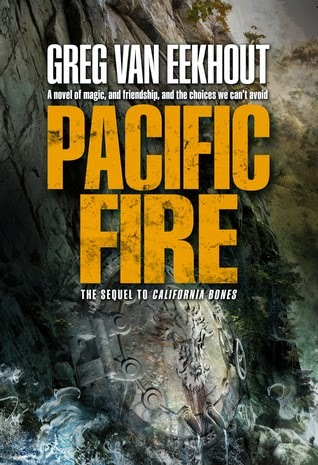 While connected to events in California Bones, Pacific Fire takes place ten years after the evens in Bones. Sam, magical child of the former ruler of the L.A. Basin, and Daniel, an osteomancer, have been on the run ever since, never in one place for more than a few weeks. It’s a lonely existence, and Sam is desperate for a friend. Or girlfriend. The chief of the L.A. Department of Water and Power tracks them both down to their Salton Sea hideout with a warning. Daniel’s former guardian Otis has a new plan to dominate the magical factions fighting over Los Angeles, and wants Sam to act as the power source. Daniel determines to bring the fight to Otis, but events sideline him, leaving Sam in charge. Sam heads to a safehouse run by some Emmas, clones of one of the more brilliant L.A. osteomancers. From there it is a race to disable Otis’ plans. ‘Yeah,’ said Moth, a little puffed up. The emotional center of the book wobbled midway through and then lost control entirely at the finish. Like The Rook, the story needs to walk the knife’s edge of risk and humor; it needs to take itself seriously enough that the reader worries about the outcome, but not so seriously that we can enjoy a self-aware wink on the way. When the stakes get truly high, with a series of devastating outcomes, the story loses its balance. Not terribly, and potentially saveable in the the third book. I will also add a general note of disapproval for the only technically resolved ending. Fans of The Rook (review) and Lies of Locke Lamora will likely enjoy this series by VanEekhout. I’m still looking forward to the third book, but I think I’ll wait on adding this to the library. Many thanks to NetGalley and Macmillan-Tor/Forge for the review copy.